On Wednesday, June 8, 2016 Continuum will be celebrating the 50 years the organization has provided crisis, respite and residential services to individuals across the state with serious mental illness and intellectual disabilities. 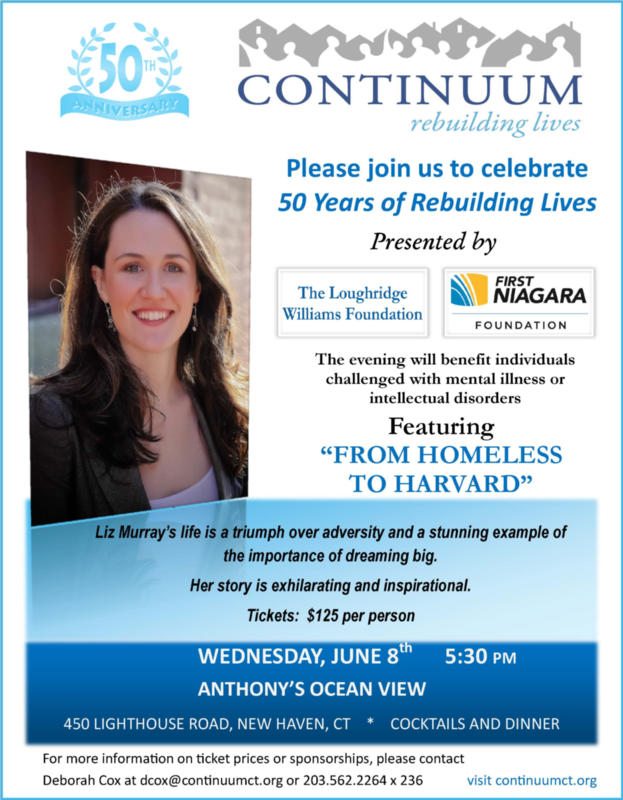 The 50th Anniversary Celebration will be held at 5:30 p.m. at Anthony's Ocean View in New Haven and will feature keynote speaker Liz Murray, inspiring author of My Journey from Homeless to Harvard and subject of the Lifetime Television Emmy-nominated movie Homeless to Harvard. Tickets are $125 per person and $1,000 for tables of 10. Contact Deborah Cox at dcox@continuumct.org or 203.562.2264 ext. 236 with any questions, or if you are interested in sponsoring or helping with planning. We welcome all donations and auction items. c/o Continuum of Care, Inc.